Home / Wrongful Death Claims / How Do You Prove Wrongful Death? When the sudden loss of a relative or loved one is caused by the negligent actions of another party, litigation cannot alleviate your pain, heartache and suffering. However, legal action may provide the financial resources for surviving family to surmount the enormous economic burdens imposed by an untimely and unjust passing. Every state has different rules pertaining to wrongful death claims. In California, family members of the decedent can pursue damages in a wrongful death claim with the aid of a knowledgeable personal injury lawyer. Effective representation in Los Angeles is available at Salamati Law, where our legal team is committed to educating clients about their rights, and the elements necessary to prove a wrongful death. A wrongful death lawsuit is a civil action that seeks monetary reparations for the passing of a loved one. This legal procedure is different than a criminal prosecution for wrongful death, which does not award damages to surviving relatives. The individual or people who file the wrongful death claim are known as the “plaintiffs.” The plaintiff is usually the surviving spouse, children, parent or legal civil partner of the deceased. In some situations, a court-appointed executor of the decedent’s estate or personal representative will act as the plaintiff. Damages awarded in a wrongful death case will account for the loss of love, guidance, companionship and financial support as well as compensation for emotional suffering, sorrow and grief. Plaintiffs can seek to recover both economic and non-economic damages for the wrongful death of a loved one, and while the majority of claims are resolved through pre-trial settlements, others may go before a jury. 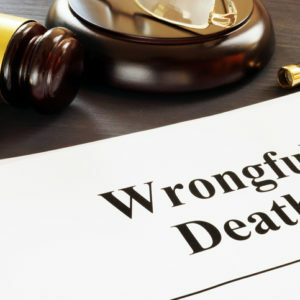 In order to file a wrongful death lawsuit, the plaintiff must present certain legal elements. The plaintiff must also supply adequate evidence to meet the burden of proof in California, which supports your allegations that the willful acts or negligence of another party caused or contributed to the wrongful death. A Duty of Care Existed – the plaintiff must prove that the defendant owed the decedent a “duty of care.” As an example, all motorists have a duty of care, or obligation, to follow the rules of the road to avoid accidents and injury. The Duty of Care is Breached — the plaintiff must also prove that the defendant failed to adhere to their duty of care to the decedent. A person who drives while texting or under the influence of alcohol is breaching their duty of care to other drivers, pedestrians and bystanders. Causation – This element is perhaps the most critical. Plaintiffs must also show that this specific breach was responsible for the death in question. Even if the defendant was driving while drunk, if the decedent was killed because his car’s brakes failed, there is not a valid claim for damages. The Death Resulted in Hardships for the Survivors – the plaintiff must also show that surviving family members have suffered physical, emotional and financial losses because of the wrongful death. Sufficient proof of negligence will hinge on the circumstances of the accident that caused the death. A breach of duty can be negligent property maintenance, surgical errors, violating traffic laws or even failing to warn consumers about a product’s side effects or risks. Under California law, surviving family members and members of the estate have just two years to take legal action after the wrongful death of a loved one. When tragedy strikes and a fatal crash leaves you bereft of a mother, father or child, your first step should be consulting a car accident attorney at Salamati Law for sound legal guidance. No matter what the circumstances, proving liability for a wrongful death is no simple task. Although your legal counsel is not required to present a preponderance of evidence to prevail, they must have compelling evidence that bolsters the credibility of a claim. For this reason, among others, it’s best to align yourself with a reputable Los Angeles personal injury lawyer at Salamati Law. Call today to schedule a free case review. Our team is available to take your call 24/7. « What Happens After Reporting Elder Abuse in a Nursing Home?